As you already know, the home based business industry is BOOMING! Aside from driving traffic and selling products or memberships, numerous people earn their living working online by writing⁄providing content for individuals, organizations and so on. If you have writing skills and are fascinated with writing, you may be ready to rock 'n' roll, creating additional income, online. But, the most crucial element to writing-and the home business blueprint-is content. Content is one thing people always need for their website, product, and blog and for other reason. There are many ways you can use your writing skills to make money online and one of the great ways is to use iWriter as a source of income. Most of you may have heard of iWriter but for those who have not heard of it, check out the following information. iWriter is a broad content writing service that has a vast community of writers and publishers-and can be used in various ways within your home business blueprint. As a publisher, you can get articles written, blog content, website content, product descriptions, eBooks, article rewriting. As a content provider⁄writer you have the choice to pick from a wide range of projects that publishers have requested and make money from it. Earning as a writer you have to be discipline and always hardworking. 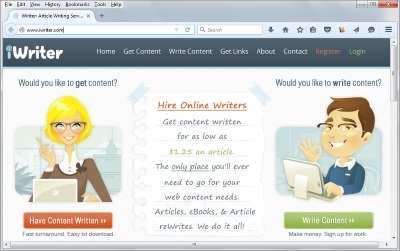 The first step in making money with them is to visit their website, iWriter .com and create an account as a writer. You should be doing this within your home business blueprint, whether you are writing or receiving content. To be a member not difficult for you only need to have an email and a PayPal account for payment and follow the instructions. You are paid based on the word count of the article you write. The more words you write, the more cash you make depending on the level you are. It has four levels which is standard⁄basic, premium, elite and elite plus. As a beginner, you will start as a standard writer. After over thirty ratings⁄reviews, you will become a premium writer. A rating of 4.5 after 30 reviews makes you an elite writer while a rating of more than 4.85 after over 30 reviews qualifies you to be an elite plus writer. The highest paid writers are elite plus writers while standard writers earn the least. To move from standard to a higher level without wasting time you can use the fast track program that requires you to have only 3 reviews and to do it; you will have to pay some money to achieve this which is optional. Sometimes, this is necessary as you progress within your home business blueprint. After writing and submitting your article, you have to wait for the client to approve or reject it. Spun or plagiarized articles are not approved on iWriter. Some articles are not approved and it is a major issue for many writers, well below are some tips on how your article can be approved. • Before you start any of the job make sure you the read and follow the special instructions carefully given by the client. • Write a unique content. • Make sure the article is organized, readable and informative. • Make sure proofread your article and correct any error. If you discipline yourself to create a unique content and you did not break any rules, you will definitely make money through iWriter and start seeing progress within your home business blueprint. Chris Thompson currently resides in Mobile, Alabama and has been an entrepreneur and seasoned traveler for many years. Aside from his business, he is busy tending to his wife and three children. Chris is a proud contributing author and writes on several subjects, including growing your own home based business in the travel industry. You can find out more about the exceptional business opportunities and receive your FREE REPORT by visiting: Chris Thompson. • How Ghost writing Articles and Books Can Earn You Big Money!